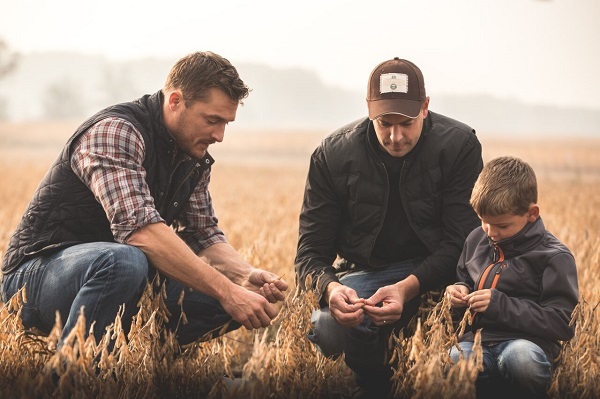 Former star of The Bachelor and Iowa farmer, Chris Soules lends a hand with corn and soybean harvest on an Ontario grain farm during his first trip to Canada in this ad campaign entitled "Prince Farming". While Chris Soules may have shown his romantic side on The Bachelor, he has another passion: grains. Grain Farmers of Ontario educates customers using former Bachelor star. The reality TV star (pictured) wasn’t afraid to boast about his 55,000-acre farm in Arlington, Iowa during his time on the show, and the Grain Farmers of Ontario took notice. According to Meghan Burke, manager of communications for GFO, the Grain Farmers team started watching the show out of curiosity. They knew Soules was a farmer, and were wondering how he’d represent the industry. “As the show went on, we started to realize he was talking about the same values we stand for,” she said. So, for the first time, the GFO decided to bring on a celebrity spokesperson to help spread its message. The organization sent Soules to a grain farm in Smithsville, Ont., where he met with the farmers and discussed the importance of agriculture and sustainable farming. The meeting was captured on camera, and the resulting video is being promoted online on the Good in Every Grain website and social media channels. He goes on to emphasize his passion for the industry and how rewarding it feels to be able to educate consumers. “It’s where their food comes from, and they should know, and they should understand the facts,” he says. The video is part of the Grain Farmers’ “Good in Every Grain” campaign, which launched last summer. Its website, Twitter, and Facebook page work together to promote the campaign, and Burke says its new Instagram account is gaining a lot of traction as well. “Good in Every Grain” won top honours in the social media category at last week’s Canadian Agri-Marketing Association’s awards. Burke says as Canadians continue asking questions about where their food comes from, the organization feels responsible for helping to answer them and address consumer concerns.